A mandatory and necessary component of any coronary intervention is the use of antiplatelet and anticoagulant therapy, which lowers thrombotic risk yet simultaneously exposes patients to potential bleeding harm. Over the last several decades numerous antithrombotic drugs have been investigated and received approval based upon lowering thrombotic events, albeit at an excess cost of bleeding. Currently bleeding is the most common early complication associated with percutaneous coronary intervention. Beside the higher healthcare costs, bleeding complications are associated with a higher risk of mortality [Aggarwal B, Ellis SG, Lincoff AM, Kapadia SR, Cacchione J, Raymond RE, Cho L, Bajzer C, Nair R, Franco I, Simpfendorfer C, Tuzcu EM, Whitlow PL, Shishehbor MH, J Am Coll Cardiol 62:409–415, 2013]. In order to improve quality of care and outcomes, several studies have been conducted to better stratify bleeding risk, implement uniform bleeding scales, and develop preventive measures. 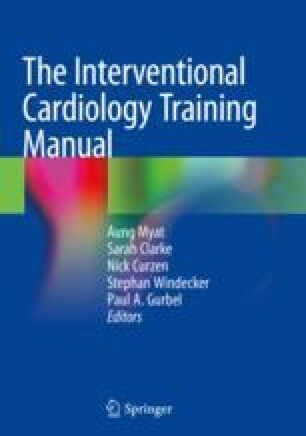 In this chapter we provide a review on definition, risk assessment, prevention, and treatment of bleeding complications associated with interventional procedures.